Couture Tray. Oh-kay. I admit, my eyebrow shot up when I heard the word couture used to describe a meal tray. A meal that had fashion aspirations perhaps? When it was laid in front of me though, all my skepticism flew out of the window. How can I not be entranced by such a pretty meal? Delifrance’s Couture Trays however, offer more than meets the eye. These couture trays are inspired by French food samplers that offer a wide array of small, delectable morsels that let you experience a wide selection of flavors and textures instead of plying you with giant servings of the same dish. With my curiosity piqued, I trooped off to Delifrance and ordered two of the Tray Coutures. I had Philippe, while my mom got Henri. The trays come standard with half a pasta dish, half a sandwich, an appetizer and dessert (that varies depending on the chef) and the diner’s choice of either iced tea, four seasons or orange juice. Philippe came with pumpkin soup and fancy, twirly breadsticks, some beef stroganoff, half a tuna-onion clubhouse and a piece of chocolate. 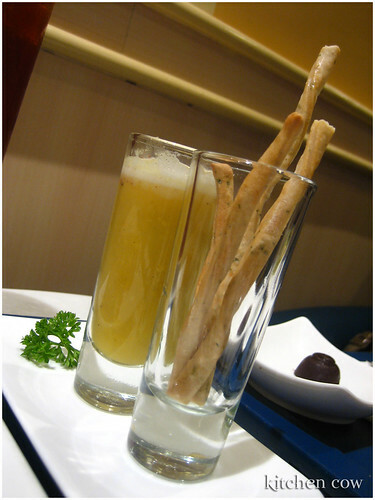 At a glance, the soup had me squealing because it was served in a shot glass! Like some soup I see on Top Chef! While there was a small spoon provided, I grabbed the glass and started shooting the soup. It’s in a shot glass, it must be taken as a shot or sipped, at the very least. It didn’t disappoint. The pumpkin soup was hearty with a slightly sweet tone underneath the savory, velvety soup. Little bits of pumpkin added to the velvety feel of the soup as it crumbled on your tongue. Mmm! The beef stroganoff was as good as always, with tender, just cooked slices of beef and mushroom coated in the creamy, slightly sour sauce and flecked with snips of fresh parsley. 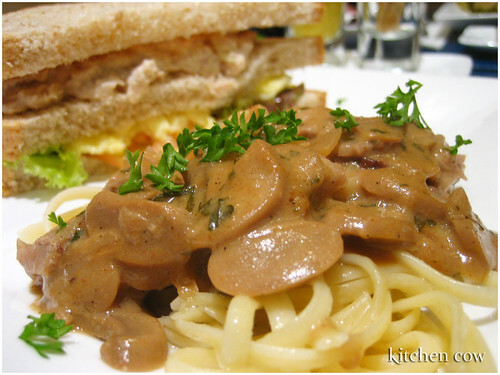 Accompanying the pasta was the hearty half tuna-onion clubhouse. Honestly though, with the sheer size of it, I felt like it was more like a small, whole sandwich—definitely filling enough for those with larger appetites. I ended my meal with the chocolate piece which was a pleasant surprise. I was expecting a run-of-the-mill milk chocolate bit. What I got was a semi-sweet nugget that was infused with what I think is orange rind. Yum! My mom’s tray, Henri, had half a premiere clubhouse sandwich (bacon, ham, and eggs) and the shrimp pesto pasta along with her pumpkin soup, breadsticks and chocolate piece. I swiped a bite of her pesto and agreed with her that it was good. They use hand-prepared pesto, the kind where you pound the basil leaves into a rough, uneven paste, unlike the kind that’s evenly run through a food processor. Aside from Philippe and Henri, they also have Amelia of the Seafood Deluxe Clubhouse and Pomodoro Angel Hair and Cherie of the California Chicken Clubhouse and Garlic Pesto. All in, I found the Tray Couture visually pleasing, substantially filling, and very delicious. Get a taste of the Delifrance Tray Couture! Enough with the rambling. This time, you can’t accuse me of making you guys hungry because Delifrance is inviting you to try their Tray Couture sets for FREE! Simply post a comment saying which Tray Couture personality you feel reflects your own personality. Be witty. Be creative. BE CRAZY! I’ll be taking comments until September 30, then awarding the 10 best replies with a free Delifrance Tray Couture Coupon. Are you satisfying, crowd-pleaser Henri? Or the delightfully, health-conscious Amelia? Possibly the sophisticated yet comforting Cherie? I’ll be waiting to see interesting comments from you folks. Thanks to Delifrance and GeiserMaclang for helping me share the food joy to you awesome guys who keep reading Kitchen Cow! Last photo is property of Delifrance / GeislerMaclang. Used with permission. This entry was posted in admin, restos & eateries, sponsored events and features. Bookmark the permalink. I like to think I’m a lot like Cherie – I usually seem highbrow and unreachable to a lot of people (I get told that a lot, must be my upbringing =_=) but to be honest, I do prefer getting cozy and warm. I have to say I’d pick Amelia. I’ve become semi-vegetarian during the last couple of years and enjoy food that’s flavorful without resorting to heavy ingredients. I’d be a Cherie, probably. I come across as unapproachable to people who don’t know me but I’m actually very uncomplicated… as versatile as chicken with a punch like garlic, hahaha! hearty /harhâ€¢tee/ 1. warm-hearted; affectionate; cordial; jovial: a hearty welcome. 2. exuberant; unrestrained: hearty laughter. 3. violent; forceful: a hearty push; a hearty kick. 4. enjoying or requiring abundant food: a hearty appetite. 5. possessing qualities befitting Captain Planet’s Planeteers. down-to-earth /dounâ€¢tooâ€¢urth, -tuh-/ -adjective practical and realistic: a down-to-earth person -synonyms hard-headed, sensible, sober, pragmatic; also a euphemism to refer to really short (read: below 5′ tall) people. I’m a selective people-pleaser and Im happy being that way. Making people happy makes me happy. I love meeting people over a cup of coffee, glasses of wine and plates of good food. So I would be Henri i think. I may be a girl but I’m the hearty and down-to-earth Philippe! I don’t mind getting down and dirty when the occasion calls for it, like trekking in the muddy fields on the way to a mountaineering adventure. Believe me, I need energy to do that which is why I prefer my meals hearty! I wish more resturants would do this sort of thing, there are days when I just want a bit of pasta and a sammich or burger. too bad i don’t live in Manila, I would jump at a chance to eat there! Screw stereotypes and give me real food! I’ll take a hearty serving of beef and mushroom and tasty chunks of chicken of the sea over pretentious rabbit food any day — PHILIPPE is the only way to go! What a range of choices! What a spread of gourmet taste! What a great selection, with little damage to my waist! What awaits my taste buds? What tray couture should I choose? With such a fine display here, I have nothing left to lose! When partnered with a pesto, it sounds like a surefire hit. Henri seems to be a winner, a good tray par for the course. I’ll get you when my hunger tempts me to devour a horse. Pomodoro Angel Hair! Tomatoes nice and tart! A healthy meal to warm my soul and satisfy my heart! Thanks, Amelia, you’re health conscious, but I’ll pass on you. I’m not a fan of seafood, and I don’t think you will do. For that same old reason, I will waffle on Philippe. but it doesn’t quite appeal to me as much as it does to you. Which brings me to my choice selection, one that does the trick. A large and luscious pesto pasta infused with garlic! California chicken! Oh, this sounds so good to me! Come into my arms and mouth, my tray amour Cherie! *claps claps* This poem is soooo Ganns. I’m the health conscious Amelia, because healthy need not be dull, bland and boring. It can be just as delicious as you want it to be, all a matter of choosing the right foods for you. I realized I want to live longer so I’ve made a conscious choice to have more seafoods, fruits, and vegetables. When you get to my age you get to think about wanting to see your grandkids get married… so now I’m more like the health conscious Amelia. Curling up on the couch with my husband, in our PJs, watching a DVD. Sitting on a bench, at the park, watching my nieces play on the swings. Laughing with my family, at the parents’ veranda, telling stories and cracking jokes. Having coffee with my best friend, not thinking of going back to the office, sharing secrets. Squeezing into one corner of the bed, my hair up in a butterfly clip, flipping through Twilight, with a tray of Philippe right beside me. Simple joys, great pleasures. Definitely Amelia! I’m a seafood lover and I always prefer angel hair to the regular spaghetti. This combo is healthy light and yummy so I won’t feel guilty coz its not gonna ruin my diet. Truly a delightful experience. Thanks! I am a very simple person yet a risk-taker when it comes to choices. So i’d have to say i like the sophisticated yet comforting Cherie. Very appealing to the taste buds. Described as a contrast. Just like my personality. I would have to say that I am Henrie. Itâ€™s but simple, Henrie is the most fashionable couture in Delifranceâ€™s line. 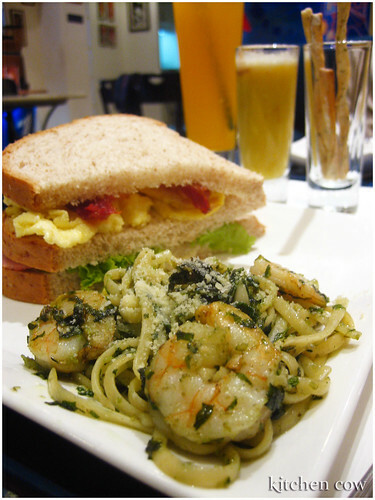 It is composed of the best materials : shrimp,pesto for the pasta and bacon and eggs for the clubhouse. I am just like Henrie- a high end type. When it comes to food, I approached with much exuberance – with a hearty appetite and hearty laughter especially when dining out with good friends whom you haven’t seen in a long while. 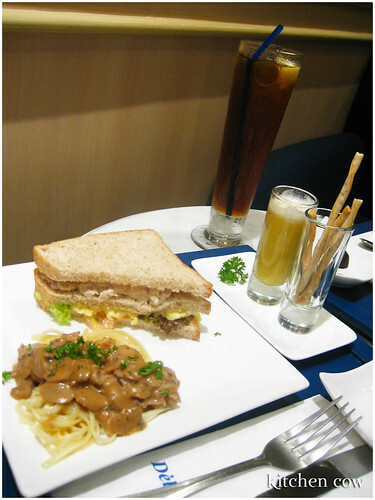 A hearty offering of tuna + mayo + stroganoff is a sure way to make my tummy full and satisfied. A favorite! For a big guy like me, a hearty meal is the way to drum up a busy working day. You’ll never go wrong with your stomach full! People may think I am a snob because I seem quiet and reserved. Truth to be told, I am exactly the opposite. I’m a cherie for I am sweet and comforting (as my friends says – I have to believe them…hehehe). Seriously, I can be someone reliable, trustworthy. For me, a taste of chicken and garlic would melt any notion you have of me. I’ve got a hankering for the tuna onion mayo… I’ve been dreaming of tuna since last week… Tuna of all kinds… Tuna melt sandwich… Plain tuna and onion in white bread… Century tuna on Skyflakes… Tuna pasta… Tuna sashimi… Do I look like a fish to you? Oui, I am a Henri, because I appeal to all tastes and characters with a hint of zest that makes them come back – or should i say, crave – for more! I am Henri. You will find me odd at first, but soon you’ll just realize how I slowly seethe into your system, inspiring into you a zest for life as tangy as basil stars heaped in a serene universe, and an aura as energizing as a clubhouse dancing in an explosion of colors of leaves and meat. Iâ€™m a Cherie. Since â€œCherieâ€ means Dear, I believe that like this tray, I have lots to offer that makes me a â€œdearâ€ one. Not just providing a healthy outlook in life but also comforting those who are in need. Given my tight work schedule, it’s always a balancing act between work and play. I play as hard as I work. To me, everything needs its balance! Even when it comes to meals, I see to it that I eat balanced meals. I need to have enough carbs, proteins, and nutrients that fits my diet. Of course flavor needs to be well balanced too! For these reasons, PHILIPPE Delifrance Tray Couture best reflects who I am. It has enough carbs from the pasta and bread to give me a boost for my busy schedule, enough proteins from the beef and tuna, and nutrients to last me the day. A well balanced meal for a well balanced guy like ME! I believe I am a Cherie: a perfect combination for a healthy meal which reflects my philosophy now:live a healthy life. I am definitely a HENRI – YUMMY and SATISFYING!!! I would say I am…. Am I a mixture of the four Tray Couture?? A Philippe coutery could well define. its truly every health buff’s wish! for extra energy to let you do more. a delightful meal thats quite hard to beat. Head to Delifrance and order one now! An Amelia I truly am. Because I may look meek and mild on the outside, but I am just as naughty and spiced up on the inside! A gastronomic dichotomy of sorts to match a seafood-pomodoro fusion. I think Iâ€™m more of a Philippe because the tray just spells â€˜food hedonistâ€™ like I am! An easy choice, am definitely a Philippe. The robust flavors and taste of Philippe positively mirrors what I want in life, to live it to the fullest, and savor all what it may offer. Then again, it is all about the carbs and the almost contrasting experience of the flavors of onion, mayo and beef stroganoff. Submissions closed. Results will be posted in a couple of hours. Thank you so much to everyone who joined. I appreciate your efforts!